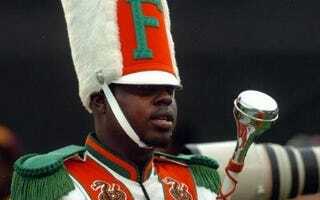 Was the FAMU Hazing Actually a Hate Crime? Following Florida A&M University student Robert Champion's death, Ebony contributor Zerlina Maxwell wonders if Champion's abuse was really simply a hazing ritual gone terribly wrong. Champion's parents revealed that their son was gay after his death, and now Maxwell and others are curious if the fatal abuse Champion suffered was because he wanted to join the band or if it was because of his sexuality. A few months after his death, Champion's parent's revealed that he was gay, leading many to wonder whether Champion was hazed more severely because he of his sexual orientation. The National Black Justice Coalition (NBJC), the nation's leading Black LGBT civil rights organization, was at the forefront urging the U.S. Department of Justice's Office for Civil Rights (OCR) and Community Relations Service (CRS) to launch an investigation into Champion's death as a potential anti-gay hate crime. “What could possibly drive someone to pummel another human being to death?” asks Sharon Lettman-Hicks, NBJC Executive Director and CEO. “It was absolutely heart-wrenching to listen to State Attorney Lawson Lamar detail the brutal beating that killed this young man.” State Attorney Lawson Lamar said during his announcement of the charges, "While Robert and his family were sacrificing and preparing for his entrance into college, which eventually should have given him a bright and meaningful future, no one could expect that his experience could include being pummeled to death," he said. Read Zerlina Maxwell's entire op-ed at Ebony.